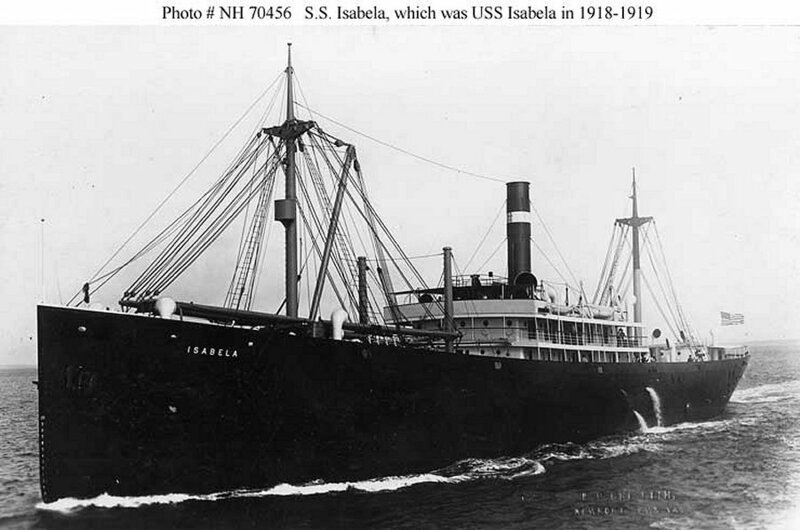 Freighter: Built in 1911 by the Newport News Shipbuilding and Drydock Co., Newport News, VA; Acquired by the Navy 9 April 1918; Commissioned USS Isabela 12 April 1918; Decommissioned 14 February 1919 at Baltimore, MD and returned to the United States Shipping Board for return to her owner; Torpeoded and sunk 19 May 1942 in the Caribbean by the German submarine U-751. Specifications: Displacement 7,050 t.; Length 347' 8"; Beam 46' 9"; Draft 20' 6"; Speed 10 kts. ; Complement 62; Armament one 5" mount and one 3" mount. 97k Photographed by E. P. Griffith of Newport News, Virginia, probably soon after the ship was completed in 1911 by the Newport News Shipbuilding and Dry Dock Co.
© 2008 Joseph M. Radigan © 1996 - 2008 NavSource Naval History. All Rights Reserved.